I love word families. The kids love them too. Once they learn to decode a word family, they can't stop. There are two parts to this packet, but for some reason I wasn't able to save it all together, so I have it as two separate packets, buy one, buy both. 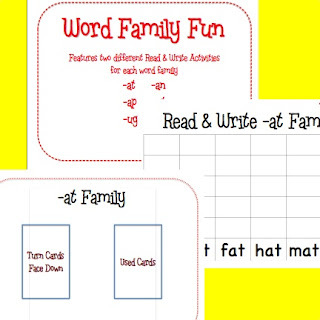 Visit my Teachers Notebook Store to see for yourself. High Five on your followers! Woo hoo! I love following your things. Keep up the creativity. I have you as a favorite. How was your fund raising walk? Thanks- the walk went well and our team raised a good amount of money, even though we were small.